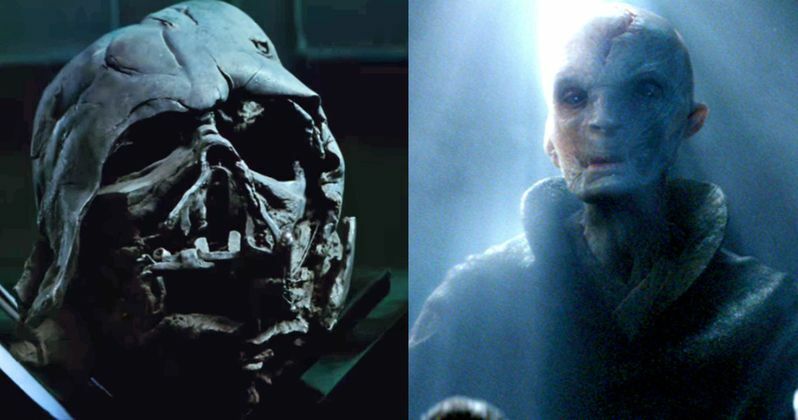 Proof Snoke Is Darth Vader in Star Wars: The Force Awakens? Who is Supreme Leader Snoke? That's just one of the many questions fans have been asking ever since Star Wars: The Force Awakens opened in preview screenings exactly four weeks ago. Some believe the First Order mastermind to be Darth Plagueis. And while there is a strong argument for that to be true, actor Andy Serkis has shot those rumors down, claiming that Snoke is 'just Snoke'. And that he's new to the franchise, though he is quite well aware of the history that has played out in the previous six live-action movies. Today, we have some strong photographic evidence that Snoke isn't Darth Plagueis. But another Darth entirely, which means Andy Serkis is still lying. We don't get to see Snoke much in Star Wars: The Force Awakens. But we can see that he has a giant scar on his head. And as evidenced in the photo below, it perfectly matches the scar on Anakin's unmasked head in this behind-the-scenes photo from Star Wars: Episode VI - Return of the Jedi. In fact, it's uncanny. Has Kylo Ren, who keeps and talks to Darth Vader's melted helmet, actually being held under the thumb of this Sith Lord himself? We know that Snoke has a grand scheme lined up for Kylo Ren, and when they set off into the sunset at the end of The Force Awakens, it's under Snoke's commands that Kylo must finish his training. We know that Snoke wants to take down Luke Skywalker, but beyond that, his motives remain unclear. Who is he, and how did he come to be the Supreme Leader of the First Order? We've heard that Anakin's Force Ghost was originally to have appeared in the movie, played by Hayden Christensen. That idea was scrapped early on, but it would have seen Anakin struggling with both the light and dark side of the Force, something that is currently conflicting Kylo Ren. Did Anakin return to his sinister ways after admitting to Luke that he was right, that there was still good left in him? This is just one of the many theories that have sprung up in the wake of Star Wars: The Force Awakens, and some, if not all, of the answers will surely be revealed in Star Wars: Episode VIII. While some speculate that Darth Vader being Snoke simply doesn't work because Anakin has died, we clearly see him as a Force Ghost in Star Wars: Episode VI - Return of the Jedi, and updated versions of the movie have replaced Sebastian Shaw with Hayden Christensen. We only ever see Snoke in hologram form. It can certainly be argued that Anakin's Force Ghost is somewhere in the universe, but if he is Snoke, why doesn't he look like Hayden Christensen anymore? That's the big wrench in this theory. Some speculate that Snoke is actually Emperor Palpatine. And no one has discounted that Plagueis theory simply because Andy Serkis says it's not so. Perhaps none of these theories are right, and Snoke is just...Snoke. Wouldn't that be a masterstroke? Take a look at this photographic evidence and draw your own conclusions. And lets remember, before Star Wars: The Force Awakens hit theaters, some of you believed that Kylo Ren was actually Luke Skywalker!